since starting school only a few days ago, it seems like there’s already so much to keep track of for both my student-kid & myself. our family calendar is full with things our family gets to do – practices, appointments, playdates, etc. and there’s not much room to write in anything else. 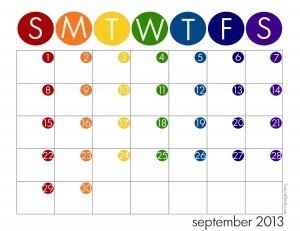 so i made this colorful school calendar for my kid to be able to write in and keep track of his own school assignments. he needs to read for 20 minutes/day, hand in his homework folder every friday, do a few pages in his math book daily, etc. not only will having his own calendar help teach him responsibility and organization, but it will help him learn the days of the week, the months of the year, and how to write out a full date. by the way, if you like these “kid’s” calendars, you’ll LOVE what i’ve got up my sleeve for next week! it incorporates these calendars and learning about dates with a whole bunch of other fun things. you can download all of these calendars for free below. 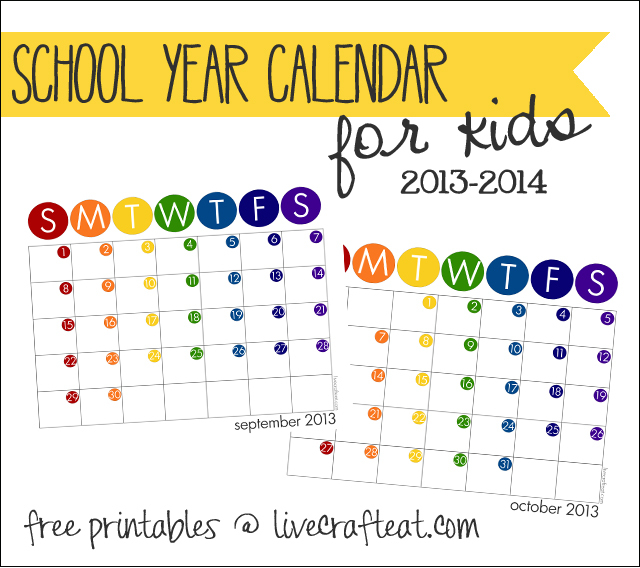 september 2013 through june 2014 are available, so you’ve got the whole school year covered! and if you’re looking for even more fun calendars for either you or your kids, visit the live craft eat calendars page! <-just click on the link! I really like the design of your calendars! Super Cute. These are great! I LOVE your printable monthly calendars, they are the glue that keeps the busy schedule in my family together! We have it on the fridge every month! Looking forward to October’s printable!! Thank you so much! Tiffany, that’s so nice of you to say! I’m so glad they help keep your family organized! The October calendar is being posted real soon, so check back in the next day or two! Thanks! Would you be able to do the other months for the year 2014 please? Thank You! These are absolutely perfect! Thank you for the entire Weather Station Set 😀 Gorgeous! Do you by any chance have 2015?!!! These are wonderful! Hi! found your calendar and thought it was wonderful with the workstation! wondering if you have an updated version for 2017-2018?